Happy Christmas Weekend friends! Very excited to share this list of reads I loved this December! Wether you're traveling far, staying near, or not traveling this holiday season I hope this list finds you well. Enjoy! 18 Wellness Trends of 2018 || Well + Good has compiled 18 Wellness Trends that will be "all the rage in 2018." I have to say YAS, I can get on board with all of these trends. Esp Moringa and Bio Hacking! Would you try Probiotic Spray for your Skin? || I'm really intrigued by Mother Dirt, this probiotic spray is formulated to restore good bacteria that has been stripped by modern hygiene to your skin. The product are science backed and too be honest I'm intrigued and want to try this spray! A Great Awakening Has Begun || If you think that your newly found spirituality is just you....yes it is and everyone else and that is beautiful. The Journey to find Jamdani || "Sometimes clothing is something bigger than fashion." I first fell in love with MIRTH before they launched in 2016 and have enjoyed these ladies rise in the "pure" fashion world. I love their commitment to the community of makers behind each piece that make. You are not somebody's hobby || A deep thought accepting your radiance and the miracles that are inside of you. Why do we drink Eggnog at Christmas? || Ok... so I'm Latina and Eggnog was not a thing I grew up drinking. TBH growing up watching it on TV I literally thought people we're just drinking frothy egg drinks...um no thanks. But now I'm kind of obsessed, especially with the Trickling Springs Eggnog....which i think is the best in all the land. DC folks add a little bit of Cotton and Reed Rum to spice it up a bit. Outdoor Voices 3/4 Warm Up Legging || If you're a fellow Lululemon rat you'll love Outdoor Voices. These leggings are just as cute as Lulu Leggings, Just as Smart as Lulu Leggings, people like these leggings just as much as Lulu Leggings. And when did it become ok for one pair of leggings to become the boss of everyone? We should totally stab Cesar!!!! 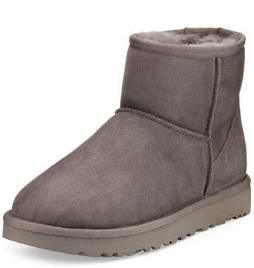 Ugg Classic Mini II || I used to love wear Uggs as shoes, but then some people told me it actually wasn't cool and they were only meant to be worn at home.... I still wear them out as shoes, but more importantly I wear them at home on chilly days I just want to be cozy and Christmas is just that time...so you know I'll be in these bad boys the entire time. Warm Light V-Neck Pullover || I'm all about a cozy sweater and this is a cozy sweater, perfect for year round chills. Kolby Brushed Scarf || Is there anything nicer than wrapping yourself up in a warm scarf? Nope, didn't think so. The Crown || Yep I already binged the second season of The Crown and although I miss my all time crush Winston Churchill, the second season is off the chains. So much delicious scandal and drama surrounding the little old lady across the pond who SHOULD be considered the most famous lady in all of the land. Sam Smith Palace || This song, for anyone who has ever hurt or moved past the hurt, this song....... I could listen to it all day. ALL DAY. Ong Namo || I'll admit I got hooked on this song because my bast fran played it a lot over the fall, and now I love how at peace it makes me feel. It's truly so stunning. The New Santa || Mila cracks me up, what a talent little kid. The Directory || Have you checked out this site's directory? It's essentially my website/blog/shopping "blog" roll. All of the content on these sites is 100% amazing. Whole Roasted Cauliflower Turmeric Soup || I would eat everything Healthfully Ever After put in front of me and on these cold winter days this soup is one of those things. Drooling. DIY Your Own Christmas Table Wreath || This post by the brilliant Rebecca Gallop also includes a simple guide on preparing your house for hosting. Winter Radiance || My friend Joanna is the perfect woman to bring out radiance in anyone.